Well, as you know, in September the new premiere shield of Arduino, Arduino YUN. This little friend has a Linux embedded system with which we can run anything you can think of (at least so far). While there is very little information on this new board, with departure in the guide that provides the Arduino page (which will link later), plus a little knowledge of many Linux, can carry out a major project a Control Access. 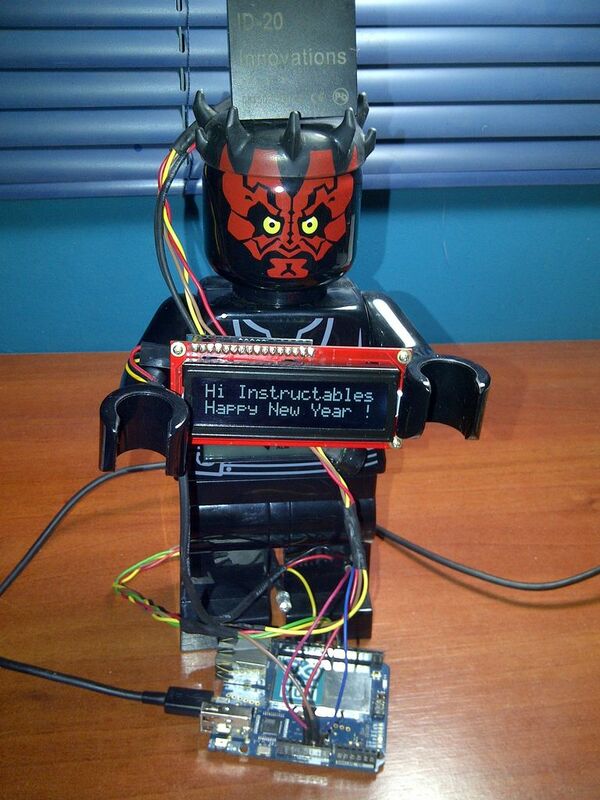 This time I will explain how to do this project, but in a manner sufficient particular all through our Arduino. This works, thanks a database server MySQL which will settle in our YUN, this database will store two tables, one for users associated with a particular RFID and another table to keep records of all cards that have passed through our reader. While we use programming languages ​​PHP and Python scripts to perform some basic and work with our data. Moreover, the hardware overhead, we use a reader ID-20 next to a Serial LCD of 16 characters, plus an RGB LED which will be our informant states. We may use this access control everything we can think of, modify, and add a relay or another idea. It can be used on anything where you have cards and want a record. Recall that this document is free publication, commercial use and exempt modifications are not allowed. I hope it’s a way more extensive path of Open Source electronics. So we go to the next step, the parties need! * Somes Header Pin and wire $5.00 aprox. In all, if you buy at the store Sparkfun, everything will be near $150. If you live in Latin America, I would recommend buying the parts in www.olimex.cl, is a very good Chilean electronics store. Few connections to do, laying down briefly explain. 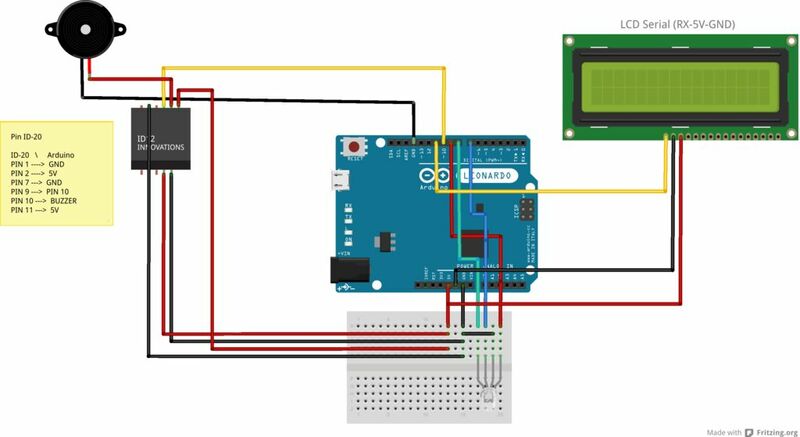 For RGB LED, red LED pin must be on pin 9 of the Arduino, pin the green LED should go on Arduino pin 8 and pin the blue LED should be on pin 7 of the Arduino. And finally, for the Serial LCD connector will only be necessary to 5v and GND pins of the Arduino, while the LCD Serial RX pin goes to pin 11 of the Arduino. Recall that by default in Bridge comes installed Python 2.7, so you never need to install any update for this. Once finished entering our codes and started the MySQL server , you should configure the database that will manipulate . But before starting to type the codes, we need to understand the fields that carry our table. The board shall consist of 5 courses, ‘id ‘, ‘ name’, ‘ name’ , ‘ email ‘, ‘ rfid ‘ to market some of them I will give a brief explanation of their use. ‘id’ : will the field or attribute int column that will tell us the number assigned to the User ID , this number is assigned by the same database and will be the way to index our records. ‘nombre’ : attribute column will be ‘ varchar ‘ may be indicated by the name with which our card user is identified. ‘ apellido’ : attribute column will be ‘ varchar ‘ may be indicated by the last name with which our user is associated. ‘ correo’ : is the attribute column ‘ varchar ‘ which will contain the e- mail the associated user. ‘ rfid’ : is the attribute column ‘ varchar ‘ which will contain the code of the RFID card you use . Again we ask for the password, you must submit it again. Now continue with the creation of the table ‘ControlUsuarios’, which will house all RFID codes passing by the reader, this table consists of 3 fields, ‘id’, ‘rfid’, ‘date’. ‘id’ is the field or attribute int column which will contain the id of each record for indexing. ‘rfid’ attribute is the column ‘varchar’ containing the RFID tag code was read by the reader. ‘date’ is the attribute column ‘varchar’ which will contain the date the card was read. Finally type ‘exit;’ in the console to exit the MySQL Query, and return to SHH so we can start with PHP5.